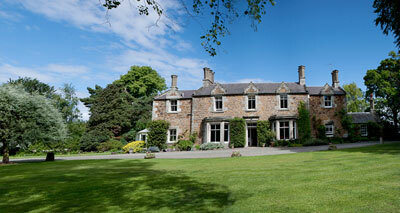 near Muirfield, Gullane and golf courses of East Lothian. East of Edinburgh (about 20 miles). Wi-Fi access. Sally and Robert Belderbos welcome guests to stay for bed and breakfast at their family home on the edge of Aberlady, a small village overlooking the Firth of Forth, 3 miles from the three golf courses at Gullane. The house was built in 1780 and enlarged in Victorian times, and still has its original decorative plaster cornices and handsome fireplaces. 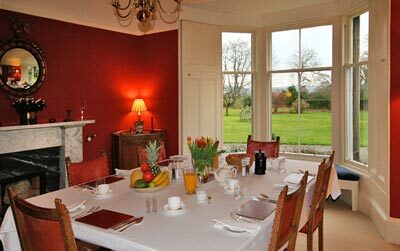 Set in 3 acres of lovely gardens with magnificent trees it is rural and quiet, though only about 20 miles from Edinburgh. Golfers will probably already know that Aberlady is very central for some of the best golf in Scotland: Muirfield, the home of the Open Golf Championship, is 4 miles away. Gullane (3 courses), Luffness, Kilspindie and Craigielaw are even closer (later in this page is a map of 18 golf courses within 40 minutes drive). Even St Andrews is possible in a day. Apart from golf - and visiting Edinburgh - other recommended trips are: wandering around the castles at Haddington, Dirleton and Tantallon, visiting Glenkinchie whisky distillery, or taking a boat round the Bass Rock to see kittiwakes, puffins and the largest colony of gannets in Europe. 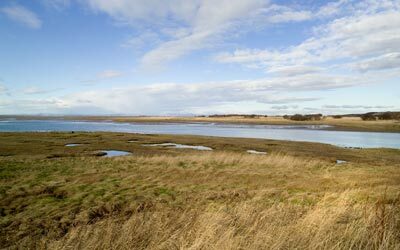 One of the best excursions is the pleasant ten minute walk from the house through the village to Aberlady Bay Nature Reserve to see migrating wildfowl, waders and seabirds. King size bed, bathroom with bath with shower, basin and wc, en suite. 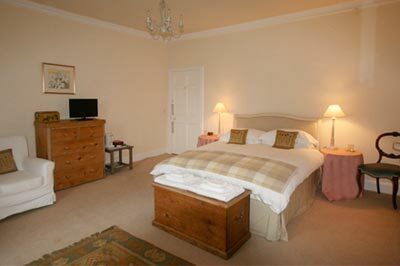 As part of the suite a further single bedroom is also availble for another family member. Views over the village of Aberlady and the Firth of Forth to Fife. 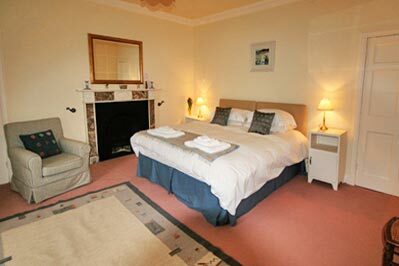 Bedrooms have Wi-Fi, tea and coffee, digital TV, hairdryer. Super king Double or Twin with private bathroom next door. 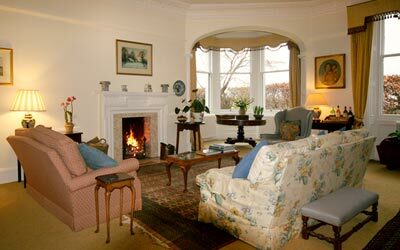 Outstanding views over Gullane Hill and golf courses and the Firth of Forth. 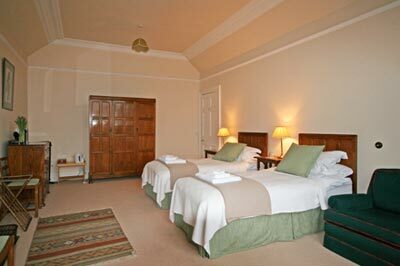 King size double room with private bathroom. This room has a single room with adjoining door, ideal for an additional family member. Super King Double or Twin room with a private bathroom just a few steps away. Views over the front garden. 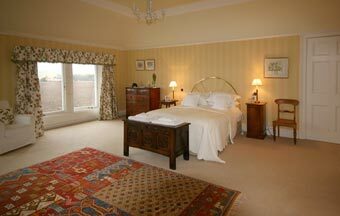 The large light Drawing Room where guests are welcome to relax. Fresh fruit, cereals, yogurt, fresh juice, croissants. Full British breakfast of: locally-sourced organic and free range eggs, bacon, sausage, mushrooms, and grilled tomatoes; or smoked salmon and scrambled egg. Choice of organic nutty brown or white farmhouse toast. Locally produced honey, marmalade and jams. Dinner: There are many local restaurants and pubs which Sally and Robert are happy to book for you. Aberlady Nature Reserve, an easy walk (less than a mile) from the house. This marshy shoreline is a well-known stopover for migrating geese, and home to waders and shorebirds. from £110 two people sharing. from £95 two people sharing. Deposit: A minimum of one night's stay will be requested. Arrival: from 16.00 onwards or by special arrangement in advance. Please tell Sally and Robert you found Aberlady Mains House through About Scotland!